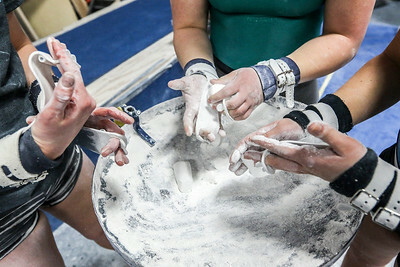 Sarah Nader- snader@shawmedia.com Gymnasts chalk up their hands during a Prairie Ridge co-op gymnastics team practice at Crystal Lake Gymnastics Training Center Tuesday, January 12, 2016. Sarah Nader- snader@shawmedia.com Maddie Solka practices on the uneven bars during a Prairie Ridge co-op gymnastics team practice at Crystal Lake Gymnastics Training Center Tuesday, January 12, 2016. Sarah Nader- snader@shawmedia.com The Prairie Ridge co-op gymnastics team listens to coach Lee Battaglia during practice at Crystal Lake Gymnastics Training Center Tuesday, January 12, 2016. 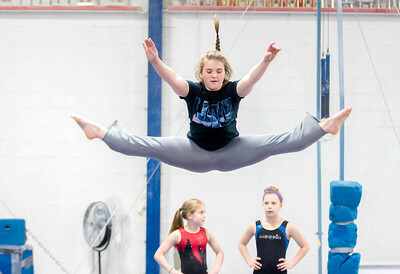 Sarah Nader- snader@shawmedia.com Rosie Devine warms up before a Prairie Ridge co-op gymnastics team practice at Crystal Lake Gymnastics Training Center Tuesday, January 12, 2016. 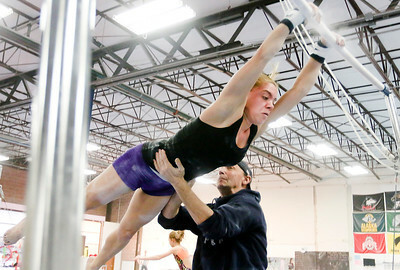 Sarah Nader- snader@shawmedia.com Nikki Baars is spotted by coach Lee Battaglia while she practices on the uneven bars during a Prairie Ridge co-op gymnastics team practice at Crystal Lake Gymnastics Training Center Tuesday, January 12, 2016. Sarah Nader- snader@shawmedia.com Elizabeth Sysol practices on the uneven bars during a Prairie Ridge co-op gymnastics team practice at Crystal Lake Gymnastics Training Center Tuesday, January 12, 2016. 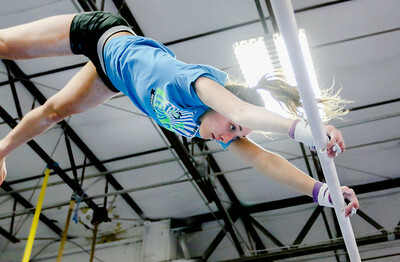 Sarah Nader- snader@shawmedia.com Maddie Solka is spotted by coach Lee Battaglia while she practices on the uneven bars during a Prairie Ridge co-op gymnastics team practice at Crystal Lake Gymnastics Training Center Tuesday, January 12, 2016. Elizabeth Sysol practices on the uneven bars during a Prairie Ridge co-op gymnastics team practice at Crystal Lake Gymnastics Training Center Tuesday, January 12, 2016.